1.This product is a security warning stickers are when the lights in the dark night, help you see more clearly in the night and minimize losses traffic accident. 2.While the label sticker in itself can emit light, not because it is auto-luminosa. 3.Thoughtful film can paste over the bodywork, helping to identify the type of vehicle, size help to avoid accidents occur during the night or raining day in minimize losses. 4.Easy to install, comes with new glue, only adhere to any place that you want. 5.The PLS NOTE: The photo that you showed is 1 roller, we will cut off for you after you ordered. 6.If you have other size requirements you can contact us. * You can stick them on your Roller skates, balance bikes, motorcycles or Baby carriages, and its reflective effect at night not only looks cool but also makes you safer. * If you are a driver, you can stick them on your truck, truck, or trailer. Their reflective effect will make your driving safer. * Or maybe you can stick them on the construction site, or where you need to pay attention, as long as there is light shining on them, they will reflect light to remind people. * We hope these reflective stickers will make your life safer and more fun. Automotive reflective sticker tape; Uses: DIY cars, buses, bicycles, motorcycles, trucks, mobile phones, household appliances, etc. Package includes: 3x car reflective stickers, solid color, the surface is three-dimensional. 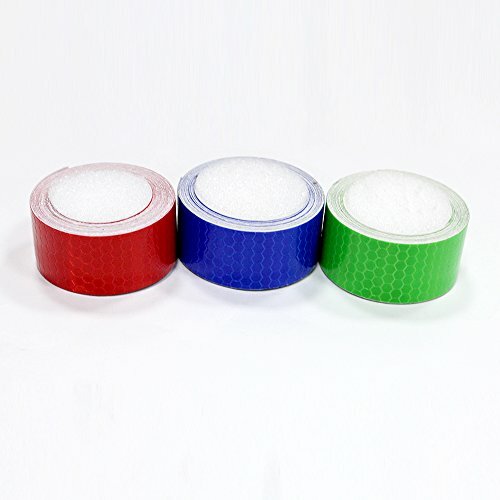 Reflective tapes play a warning and reminding role and are mainly used for road transportation facilities, vehicles, bicycles, bicycles, automobiles, motorcycles, ships, navigation channels, stage, various channels and related mechanical equipment. The body reflective film can obviously linearize the body contour, help to identify the type of vehicle, size and avoid accidents. Please note: The displayed image is one of the sizes. Your purchased size will be provided for you. If you need a receipt of other sizes, please contact us. If you have any questions about this product by Muchkey, contact us by completing and submitting the form below. If you are looking for a specif part number, please include it with your message.